OK, here’s a mystery. When I am spinning separate bobbins to ply together, like I’ve done this week, each time I weigh out the wool for that bobbin so they are equal. Since I’m spinning pretty consistently now, it makes sense that each bobbin would end up with more or less the same length of yarn on it, right? So here’s what happens: the first two bobbins are, yes, within a few feet of each other, like 3 or 4 feet difference. 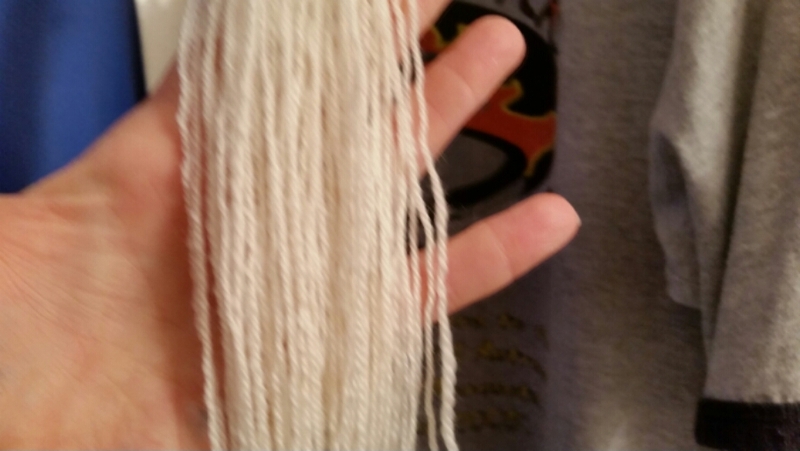 When you consider how far even one gram of wool spins out, that’s a very small difference. But the THIRD bobbin, for some reason, ALWAYS is more like 12-15 feet longer than the other two. I know which one is which because of the order I put them on the kate when I finish each one. So yes, I finished the last bobbin tonight and plied the yarn. In today’s picture, it’s still wet, it will fluff out as it dries.